Apple simply shouldn't have offered the i9. Offering it was a bad design decision. Really upset about it, as having a high performance MacBook Pro was really needed. I don't believe other manufacturers have this issue, and even if they did why should Apple be able to get away with it. I just want a product that gives me the performance that I (would have) paid for. So you can reach full turbo on all cores? Have you tried Prime95 or even LinPack? Are you talking about during startup? 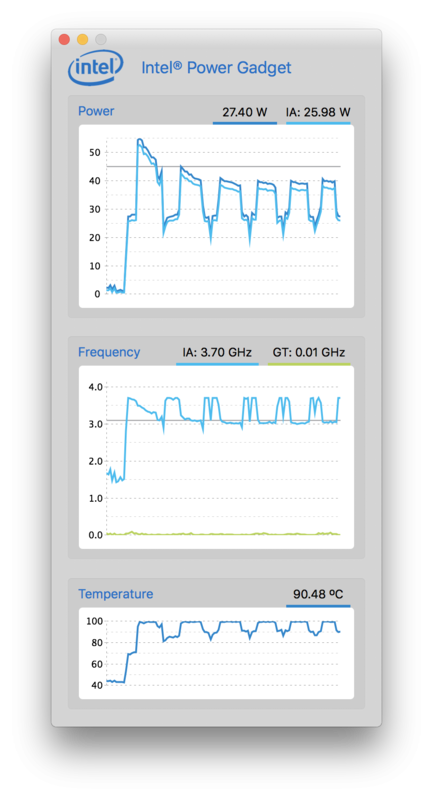 If so - then yeah - while the CPU is cold it will burst pretty high (but not to the 4.1GHz max) even if you're hitting all cores... but then it settles back to ~3.3-3.7GHz as the max with all cores running (see my earlier post showing that it pegs right at 3.7GHz)... which is below the 4.1GHz that's stated. The other thing with the scientific code is it initially does more on the first processor - then the others fill in and it stays pegged on all four until the end. So some of that initial burst is a bit because it's one core starting up for a moment. Oh yeah, the 3.7GHz is just about right, that's the maximum all core turbo frequency for the 7920HQ. I wonder what's the temperature and power consumption when you hit 3.7GHz then? Since you asked for it - here is Intel's MKL version of Linpack running on 4 cores on my laptop. It would be easy to say "Look at that throttling!" but it's NOT throttling! That is just the algorithm doing it's iterations. Each one of the frequency dips corresponds to finishing an iteration... when there is less work to do. You can also see some smaller dips in the middle of each iteration... further proving what I'm saying: that the frequency dips when the program dips in terms of instruction execution. Each iteration the problem size is actually getting smaller - which is why you start to see larger and larger dips as the run goes on. And this is _Linpack_ - it is specially designed to _hammer_ processors. I wonder what's the wattage in each single loop? Nah, not from the wall. I mean the watts when you hit almost 100C and fully loaded 3.7GHz. I'm sure 29W is idle consumption. People surprised about this should get a desktop, like a Mac Pro. This is nothing new. The thinner the body , the more likely the computer will throttle,to maintain temperatures. I suspect there would be even more complaints , if fans on MacBooks made more sound. The issue is that the i9 MBP isn't performing as advertised in these tests. That's a completely different issue from a user choosing the right tool for the job. Did Apple say that the processor wouldn’t be throttled? Don’t think they did, no. It is logical that there is throttling for the burst frequency, but it is unacceptable that a there is throttling below the base frequency, which is defined as the frequency at which the CPU can run irrespective of the load. If these test results are confirmed by others and Apple has no remedy in the short term, I can only have serious doubts that Apple can still be a trustworthy laptop supplier, who does not deceive the customer by marketing claims it cannot fulfil. Apple would better invest more time in building the best qualitative laptop available iso. focusing on thinness, which is, for professional laptop users, not that important. Try find someone who can sustained the max turbo boost speed that’s not a gaming laptop. please read the post before. Maybe it is you that should read his post again. The post I was replying to notes that the processor should be able to handle sustained base frequency loads. "I can only have serious doubts that Apple can still be a trustworthy laptop supplier." Sure. Meanwhile your "trustworthy suppliers" still throttles like hell, but I'm sure you know how to keep i9 throttle-free. So we are saying Apple is of the same quality as the other suppliers? You justify a fault by deflecting. It’s the old, “every else does it.” We pay much more for Apple produxets, I’d we wanted what everyone else is doing, we could buy it for much less. He simply notes that he may not be able to trust Apple anymore. He doesn’t at mention other suppliers, you are speculating that he trusts them. Then - from the plot - it shows it at ~40W during most of the iterations... but it hits ~55W in the very beginning. Well, if you want to bring an i9 to maximum performance, you got to have the size of a gaming laptop to begin with. I don't think many realized that in the first place, that they think "If we just make it thicker, it will be no problem" -- they did not realize how much "thicker" it needs to be to achieve that performance! And if you do get a little thicker (or you can go all the way to Unibody), sure it will be better, but still throttles significantly, in the end you're not solving problem with it. So if your "trustworthy" is to build upon the throttling, do you really want to go that way? Also, if 10nm arrives next year, all of the power consumption and throttling will go down and probably back to normal too. Why not, it is just one more choice. If you don't like you take the i7. For the real pro it is ok, when you needs sustained load, you are working on long computation on the desk. If you spend all that amount for the i9 version, you can also add 20-30 bucks for a good cooling pad to put under the macbook. A lot of people do it already, mostly in the PC world and most of these pads can be carried around also in case you need. 40W running with LinPack? From what I've gathered, even a 7700HQ runs more than that in Prime95 (That's less stressful than LinPack). Or maybe you're having a good quality processor to begin with -- not every processors have the same power consumption. Here's the thing for LinPack though, that if you're running multiple programs in background, LinPack will not utilize it's fullest potential. The best way to testing it out, is to restart and disable all of the applications in the background (leaving monitoring software open), then run the LinPack and everything works like planned. here's a post on how to. I'm VERY well-versed in LINPACK - I would never even consider posting a score from OSX as it's pointless... but it does a well enough job at showing my point that instruction pressure matters in forcing the clock speed to stay high. As soon as instruction pressure lets off even just a little bit the processor will down-clock to cool itself. That's exactly what we're seeing in the video posted here by AppleInsider... I think they're now doing a lot more testing so they'll be able to tell us more soon. I posted a a couple of small C++ programs for them to try and I hope they do... because then there is no argument about what is happening. If the clock speed won't stay at or above the base clock speed while running an infinite loop with floating point and integer arithmetic in it... THEN there is something wrong. Otherwise, it's just the processor doing what it can to stay cool given the current instructions being fed to it. Huh, well that's interesting. It's not like I think you're biased, but I'd never thought a 7920HQ can run LinPack within 40~50 watts. I’ve seen people complained a lot on notebook forums, on the reviews, that most of them exceeds the TDP. Maybe you have a really good processor to begin with, that might explained. I wonder what happened if you try Prime95 then? You can't really get any more instruction intensive than that! (ok, well - I didn't bother targeting AVX which could possibly activate more pathways through the processor that aren't being exercised there to get an even larger thermal boost - but I doubt it would do much. Could try enabling some optimization to see what that would do - but it might also just optimize out the loops completely!). I've got a Core i9 MBP on it's way here, and I'll be so relieved if the throttling can be mitigated through firmware updates. I think Friedmud is really onto something. I'd prioritize his tests over all others. He cannot solve the throttling problem, but you can by buying a cooling pad. Will probably do that. I understand he can't solve the problem, but a result for his test might give us a better understanding of *exactly* what's going on and what can and cannot be done to remedy it (on Apple's end). I think it's time to ditch Intel and pack a pair of A11 bionic in a MacBook Pro. 12 cores sucking just the power of two iphones. that would be interesting product to use. Also, what's with Adobe and not optimising premiere for mac... it's just absurd. Most of creatives that pay for adobe suite use macs. So you could actually stick 9 A11s in a Macbook Pro. 54 cores anyone?? I mean I'd probably go for a nice power savings and only use 4 A11s, that'd still be 24 cores. It's going to happen, only a matter of time. I would say it will happen very, very soon.Like 1-2 years max. The ARM chips are on par with x86 while consuming way less power. They're definitely already working on it. I imagine they'll come out with a special A-series processor that's optimized for laptop use. I believe the current phone processors have some super-low power cores, maybe a laptop doesn't need as many as those. The question is whether they would be 'apples to apples' when it comes to running the OS and doing real-life stuff. While I suspect Apple's architecture is more efficient, I kind of doubt it is 9 or 10 times more efficient. I kind of doubt the A11 is actually doing the same kind and intensity of 'work'. If I'm wrong, then yes, this change could be really exciting (aside from loss of x86 compatibility, which a lot of people use). ... Here's my issue with the current set of tests - we don't know what the instruction intensity looks like for these applications. Intel's procs are REALLY good at throttling down if there is even the slightest bit of slack in instruction intensity. It will show as dips in the frequency - but it's not because of thermal throttling... it's because the processor has a moment to "breathe"... so it does. Absolutely the tiniest stall in the instruction pipeline (due to waiting on file-io or any other resource) will instantly bring the clock speed crashing down. This is why we used Cinebench. We know that there are no breaks in instruction intensity. If it is true that the YouTube'r fixed it by putting it in a freezer (not something I'd recommend), then it was the thermals, not the app. Of course, each user's workload and workflow varies, so I would advise potential buyers to wait a bit until their chosen applications are updated for both the hardware and Mojave, and then find some savvy tester to confirm performance, one way or another. That's the real key here. Even throttled, it might be better for some situations.... like actually running a bunch of apps and VMs, or where you can fully utilize the 6 cores (like a rendering engine where each core gets an 'engine'). Interesting article... this line also caught my attention: "They also differ in terms of manufacturing process (14nm++ vs. 14 nm+), and the new process already includes updated micro code against Spectre v2." "Apple usually removed the TDP limit for Intel processors, so the temperature was the only limiting factor. This is the case here as well, and we can see consumption values of almost 50 Watts." "All in all, the new MacBook Pro 13 is faster than the old previous 2017 model, but some Windows devices are faster with supposedly slower CPUs." I doubt the Spectre fix has too much of a performance hit, but it is interesting to note. But, if it's faster than the 2017, that's an improvement even if it isn't gaining the same advantage of other Windows laptop (which is kind of irrelevant if you need to stay on macOS. Apple simply shouldn't have offered the i9. Offering it was a bad design decision. Yeah, if the design can't handle it, kind of silly to offer it. Initially, I thought the i9 was the 6-core chip, but seeing the i7 is also 6-core... what's the point of some supposed potential power you can't use. The 6 cores (instead of 4) is the big deal to me, not the i9. There is no way other than thickness? But yeah, going back to the unibody would be find by me, especially for a high-end version of the 15". True... now that we know. But, this probably ticks people off who just go to the Apple Store and pick maxed out configs. Apple fans don't buy for performance. The brand is the most important. It was obvious before the first test, that the thin body won't be able to handle the heat of an i9. You can buy a real i9 laptop with 32 GB RAM, 6 TB SSD and GTX 1070! for about half price of most expensive MBP 15 config (4TB SSD, no GTX at all). Of course heavier, but you just can not expect a thin machine Wich handles i9.